What is 'black swan' theory? 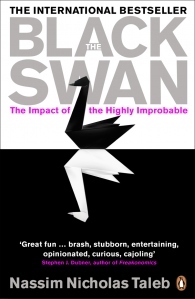 Nassim Taleb's The Black Swan (2007)puts forward the theory that the most important events are usually impossible to predict. The title refers to the fact that all swans were believed to be white - until a black one was discovered. There are known knowns. These are things we know that we know. There are known unknowns. That is to say, there are things that we know we don't know. The events that impact on our lives most are impossible to predict. After they occur we find rationalisations for them but we should accept that random events may disrupt any model or plan. A very interesting book! And I like the phrase unknown unknowns.